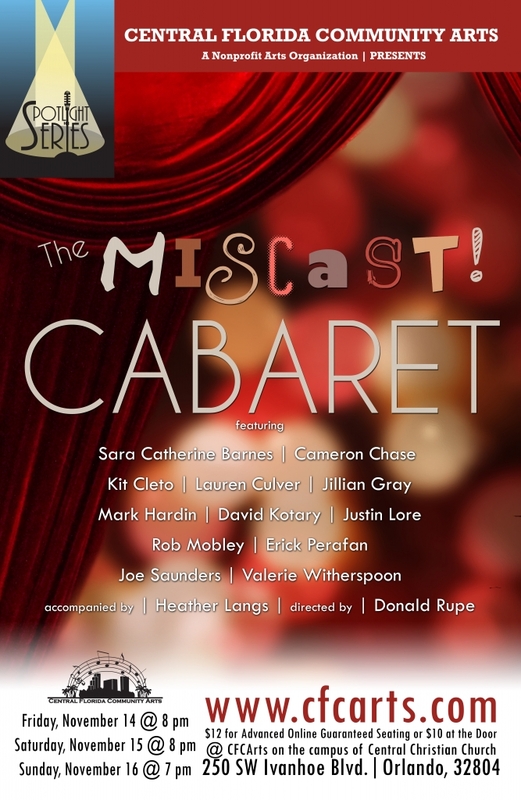 Our Spotlight Series for November, Miscast! Songs We Aren’t Supposed to Sing, gives our performers the opportunity to present songs they were never technically meant to sing – but secretly always wanted to! A female vocalist performing that “guy song” she’s always loved? A man singing something usually performed by a little kid? No problem! Our incredible vocalists will search through the musical theater songbook for characters and songs they all secretly wish were written for them! Miscast! Songs We Aren’t Supposed to Sing will take place on Friday, November 14 and Saturday, November 15 at 8:00pm and Sunday, November 17 at 7:00pm. Performances will be at CFCArts’ Central Campus, which is housed on the grounds of Central Christian Church, 250 SW Ivanhoe Blvd., Orlando, 32804. Please park behind the church, going around the left side of the building and taking care to turn before the I-4 entry ramp, which is next to the church’s driveway. Guaranteed seating can be purchased in advance for $12 (credit card/Paypal). Remaining seats, if available, can be purchased for $10 at the door (cash/check only). Doors open 30 minutes before showtime and all seating is general admission.